If you are not like me you like your breakfast to be a bit different every day. I don’t seem to vary my breakfast much. I either have porridge or muesli, although I vary the things I put in them depending on what I have in my cupboards and freezer. Some people though don’t like to have the same breakfast every day as they get bored of eating similar thing every day – my sister for example! And I am sure there are others who feel the same way. Also, it’s not recommended by nutritionists to eat the same food every day as allergies or food sensitivities could be developed over time. It could be a challenge to eat a healthy breakfast every day of the week for some and this is the reason why I put together the following healthy breakfast ideas. This is also something I will look at in the future so I can try different kind of breakfast every week. Porridge must be my favourite breakfast and there are so many ways you can make a really delicious meal out of it. 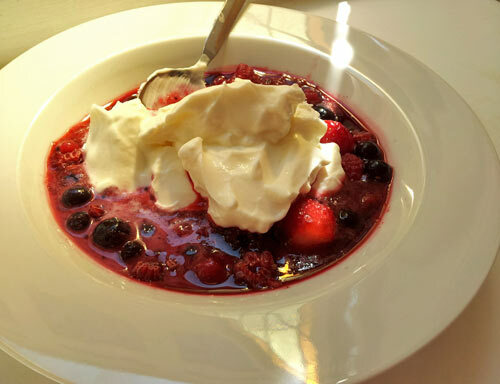 You could try blueberry porridge with seeds, fruity porridge or you could experiment making your own version. Possibilities are endless. I would recommend you always add some kind of fruit to it (vitamin C!) and protein (to keep you fuller for longer). You could try adding the following protein: nuts, seeds, natural yoghurt, almond butter, peanut butter and hemp protein powder. 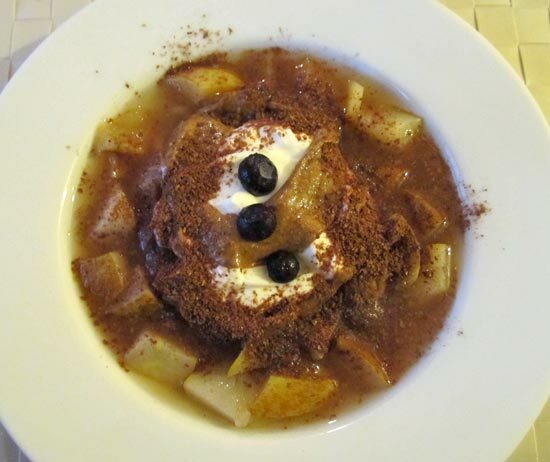 Add a sprinkle of cinnamon for a sweeter taste or raw cocoa powder for extra minerals (magnesium and iron). If you don’t have time making porridge in the morning you could make overnight oats instead – prepare everything in the evening so when you get up the breakfast is ready. 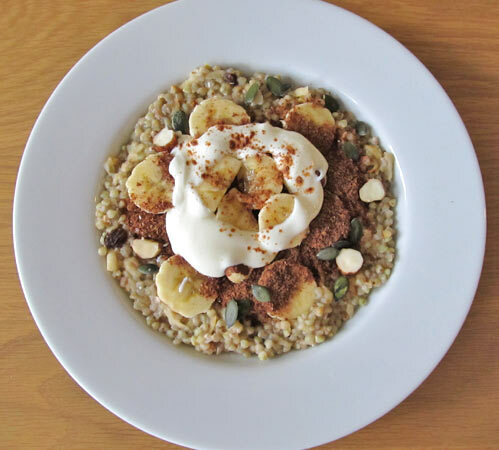 If you are getting bored of oatmeal try making quinoa porridge instead and see whether that’s to your liking. You can make your own muesli at home by buying a muesli base (I buy it from Holland & Barrett). This way you are in full control what you put in your muesli. You don’t have to add dried fruits to it – instead add fresh fruits and seeds and nuts. I find most of the muesli’s from the supermarkets tend to contain too much dried fruits, so making my own muesli at home seems like a good idea. Buckwheat flakes are great for a gluten free breakfast. Try nutty buckwheat flakes with fruit, yoghurt and flaxseeds for example or make it simpler by just using some almond milk and fruits. It’s up to you! You could also add seeds and nuts if you like. Eggs are so versatile and you can make them in a variety of ways, but one the healthiest ways is to boil them (or poach them). 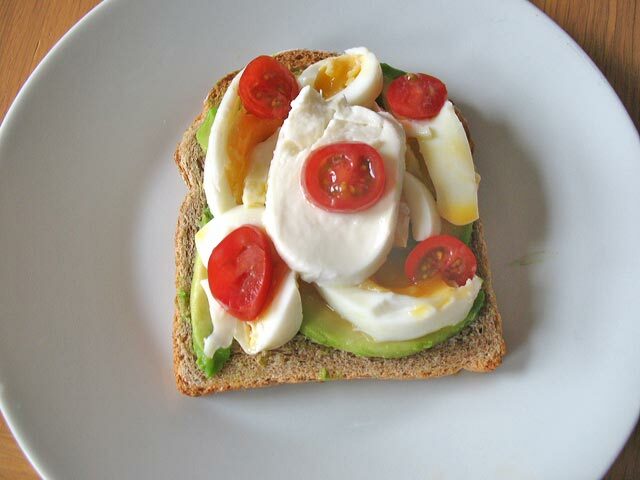 For a healthy and filling breakfast have boiled eggs on a brown toast with avocado and plum tomatotes – this is exactly how I like them (although I don’t eat them for breakfast!). Add some low fat mozzarella cheese for extra protein if you like. 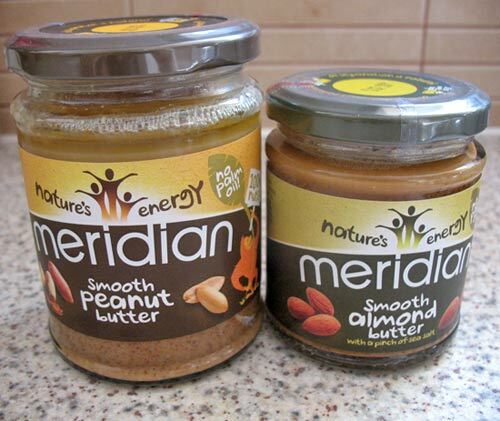 Nut butters are rich in protein and vitamin E and they can make a healthy breakfast if eaten in moderation (they are high in fat). Have a peanut or almond butter on brown toast with strawberries or other fruits on the side. Make a fruit salad out of various fruits such as apples, pears, strawberries, blueberries, bananas, etc. and pour 200ml of natural yoghurt on top. 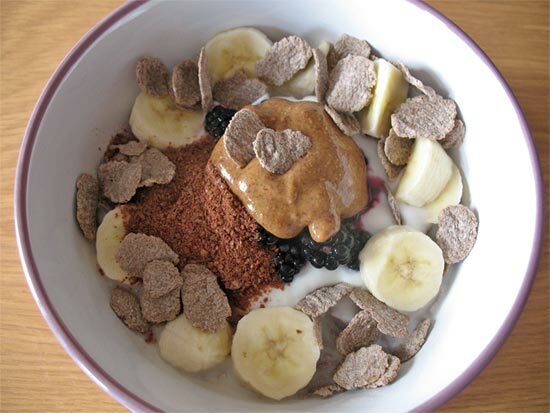 For that extra protein add hemp or chia seeds and sprinkle with cinnamon for a sweeter taste. You could also add flaxseeds or oat bran to feel fuller for longer. This low fat soft cheese (similar to cottage cheese, only smoother) is much more healthier than any other type of cheese. It contains less than 1% fat and it’s high in protein so you will be making yourself a favour if you eat this instead of high fat cheeses. Spread it on brown toast and add a blueberry jam with no added sugar on top (I use wild blueberry jam from St. Dalfour). You can also eat it savoury, for example with olives, tomatoes and cucumber. Try it in a different way and see which one you prefer. If you cannot find it in your local supermarket you could use cottage cheese instead although the texture will be different. If you can stomach green smoothie early, go for it! If you can’t, you could choose to blend from the following: banana, avocado, hemp seeds, flax seeds, almond butter, chia seeds, strawberries, blueberries, oats, apples etc. A simple and healthy smoothie you could make easily is by blending one banana, some strawberries, 3 spoons of hemp seeds and almond or coconut milk. You can even put nuts in it! Depending on how much protein you put in, it could keep you full for a quite some time. If you need some ideas on what kind of smoothies you could make for breakfast, check this recipe page on Spoonie Sophia blog – you will find some great smoothies to try out. Sophia has some amazing pictures and smoothie recipes on Instagram as well so I recommend you follow her. To make breakfast bars healthier use a rice syrup to sweeten them as this is better than using agave or maple syrup. If you like your breakfast savoury, hummus is a good choice. The best is to make your own hummus at home to control how much fat there is in one portion. Hummus is very simple and easy to make. All you need is chickpeas, fresh lemon juice, tahini, garlic and salt which you blend all together until it turns into a smooth paste. You could eat this with pitta bread, olives, tomatoes or cucumbers. Experiment and see which version is your favourite. Energy balls seem to be very popular at the moment. I saw them on various blogs and you can even buy them in health stores. They are easy to make at home though and you can prepare them in advance. They would keep in a fridge well. I found energy balls on this website particularly attractive. I think they are great for breakfast on the go. How do you make your breakfast healthy? Do you have any other healthy breakfast suggestions? Thanks for stopping by! Yes, you should give hummus a try. I normally eat it as a snack but it’s a good breakfast too.